There are two easily utilized methods of transferring from Seville Airport (SQV) to the city centre of Seville; taxi and bus. The airport is linked to the city by a large main road, and both methods are easy to access from the airport terminal. Taking a Seville airport taxi is the most efficient and comfortable method of transport. The journey takes around 15-20 minutes and will cost approximately 23€. If you would prefer the public transport option, there is a bus that will take you into the city for a cheaper price of 4€, with a slightly longer journey time of approximately 30 minutes in usual traffic. Welcome Pickups offers meet and greet services and a friendly introduction to Seville at the same price as a regular taxi. Click here to see the cost. The most comfortable method to journey to the city from the airport is by taxi, especially if you have luggage. The Seville airport taxi journey into the city will take approximately 15-20 minutes dependent on traffic. Most taxis in Spain are trustworthy, especially when taken at designated taxi ranks, and are usually white with a yellow stripe. They will usually have an illuminated sign (green means free), and the licence displayed in the taxi. Drivers usually are very knowledgeable of the area, but if communication is a worry, you can always approach an information desk of the taxi company located in the airport. Be aware that with large flight arrivals there could be a wait to catch a taxi from the rank. There is no set price for the taxi ride from Seville Airport (SQV) to the city centre. However, under normal circumstances, the ride should cost between 20-25€ depending on where you are being delivered in the centre. The fare should be displayed clearly on a meter and the driver may only charge you what is displayed under law. Nevertheless, if you have a lot of luggage they may ask for extra. To avoid any issues, you can pre-book or ask for the approximate price of the driver before you take this method of transport. Daytime rate: (Mon-Fri 7am – 9pm) the price ranges from 20-25€. Night-time rate: (Weekends, holidays and evenings between 9pm – 7am) €25-27. Be aware that Spanish Holy Days may incur an extra 25% on the night-time price. Taxis are ideal for a quick journey into the city and assured arrival at your destination while avoiding the issue of getting luggage on and off public transport. Taxis are reasonably priced and operate 24/7. The only problems that regularly occur with taxis in Seville are those taxis which are operating independently. To avoid a scam, ensure that you are only taking taxis that display a licence, have a meter or are located at official taxi ranks. Do not accept rides from people casually offering at the airports. These drivers target tourists and overcharge them for an easy scam. Make sure you have enough cash - not all taxis accept cards. Drivers in Spain are well trained in the area, yet it could be helpful to have a picture of your hotel and address to save any language barriers from being an issue. Luggage is charged by drivers at 0.44c per bag. Seville Airport (SVQ) is also named San Pablo airport by locals. Seville Airport (SVQ) has a designated bus that travels between the city centre (Plaza de Armas) and the airport, with many convenient stops. 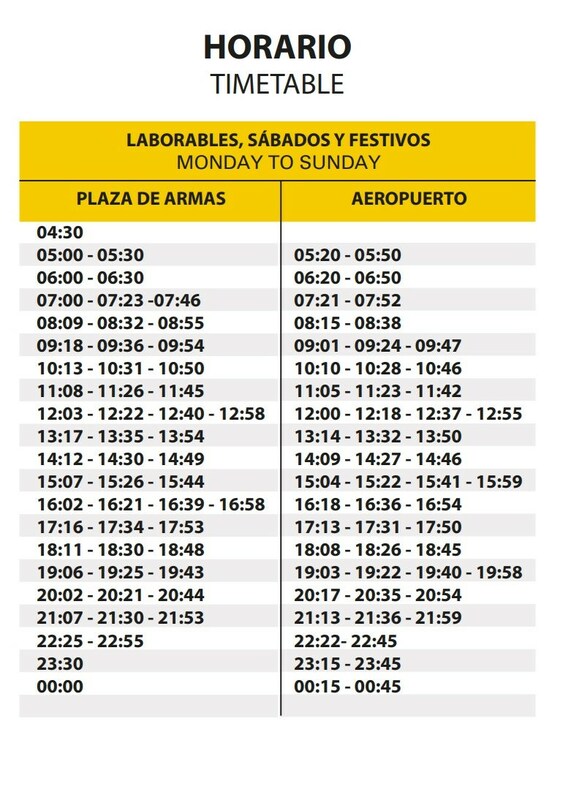 The line is named Línea EA: Airport Special and will take around 30-35 minutes to reach the centre in normal traffic. The operating hours for the bus are 5:20am –00:45am, leaving every half an hour, 7 days a week. How much is the bus from Seville Airport to the city centre? The fare for the bus is 4€ for a single ticket, which can be purchased on the bus when you board. Wait time can be up to 30 minutes. The EA Line runs between 5:20am –00:45am, leaving every 30 minutes, Monday to Sunday. The bus stop is located directly outside of the main terminal building of the airport, next to the taxi rank. The price of the bus from the airport is far less than that of a taxi, however it is notably less convenient. The journey is much longer as the bus has multiple stops on the way. The bus may also be crowded at peak flight arrival times and can be difficult if you have multiple bags with you. If you will be utilizing the bus frequently during your stay in Seville, you can purchase a rechargeable travel card for an extra 2€. These may also be purchased from the bus driver when you board. Buses in Spain have designated travel lanes meaning that sometimes, in heavy traffic, the bus can actually be quicker than a taxi. The bus line EA stops at many popular hotels along its route to town. Check the timetable as this may be a convenient option for transport if you plan to take public transport. Throughout the summer period of June - September, buses run more frequently. If you feel more relaxed knowing that somebody is waiting for you, you may as well book a Welcome Pickups transfer. As soon as you arrive at the airport you will be greeted by your driver. He will be waiting for you at the terminal of your arrival with a sign that has your name on it. Your driver will help you out with your luggage and together you will make your way to the vehicle. While he is driving you to your accommodation, the driver can give you some tips and recommendations on what to do during your holidays in Seville. Our drivers are hand-picked and speak fluent English. No need to worry about miscommunication issues that you may face with the local taxi drivers regarding your destination. Relax and enjoy your ride. How much is a taxi from Seville Airport to the city centre? The taxi from the airport to the city centre will cost around 23€. The cost will vary depending on where you would like to go in the city as well as weekends, holidays and night-time transfers. How far is it from Seville Airport to the city centre? Seville Airport is located around 11km from the city, depending on which route you take. How many transfer options are there from Seville Airport to the city centre? There are two transfer options from Seville Airport into the city, by taxi or bus.